Using grapevine boughs from her father's property, Emma painstakingly wove them over the arches after removing the remnant old branches and wire. 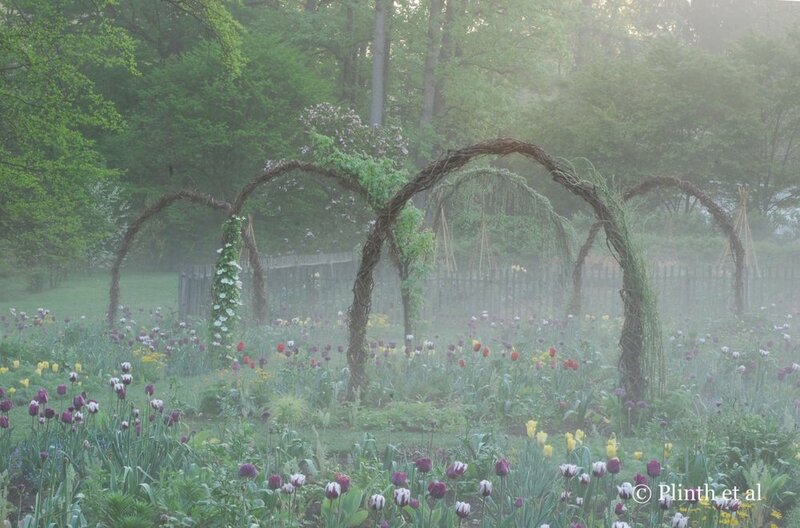 A constant in the Cut Flower Garden, the arches are structurally significant, giving height when the beds are bare in winter and early spring. Cloaked in vines and engulfed by the riot of vegetation, they become less visible later in the season. 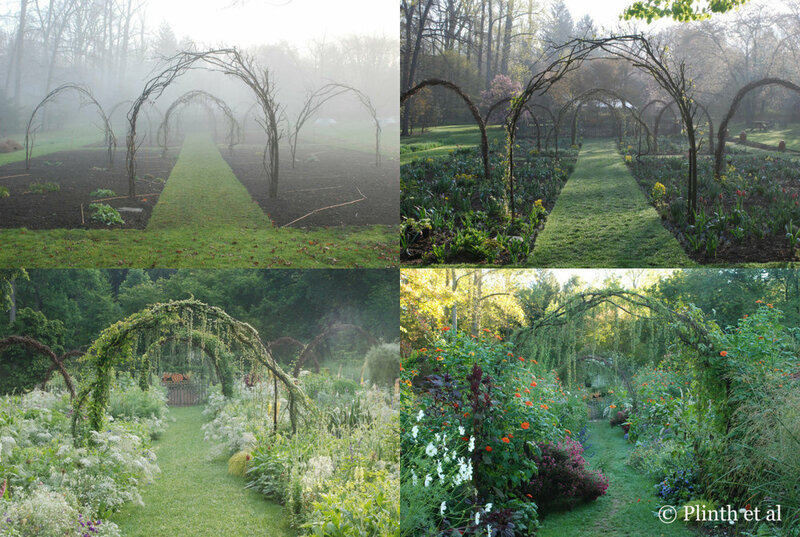 My name is Emma Seniuk and I am the cut flower and vegetable gardener at Chanticleer in Wayne Pennsylvania. Emma effectively groups tulips in blocks that drift across four beds, creating continuity through color and form, and their simplicity (three to four varieties) is fundamental for success. Like most gardeners, I've loved plants since I was a child. Over the years I have worked at a variety of jobs- nurseries, landscaping, beekeeping, helping to manage a Christmas tree farm but once I was introduced to public horticulture I was drawn in, hook, line and sinker. I worked at Mt. Cuba Center as a seasonal, Longwood as a student, volunteered at Chanticleer over the years, had a year and half long studentship at Great Dixter and now am fortunate enough to be full time at Chanticleer. 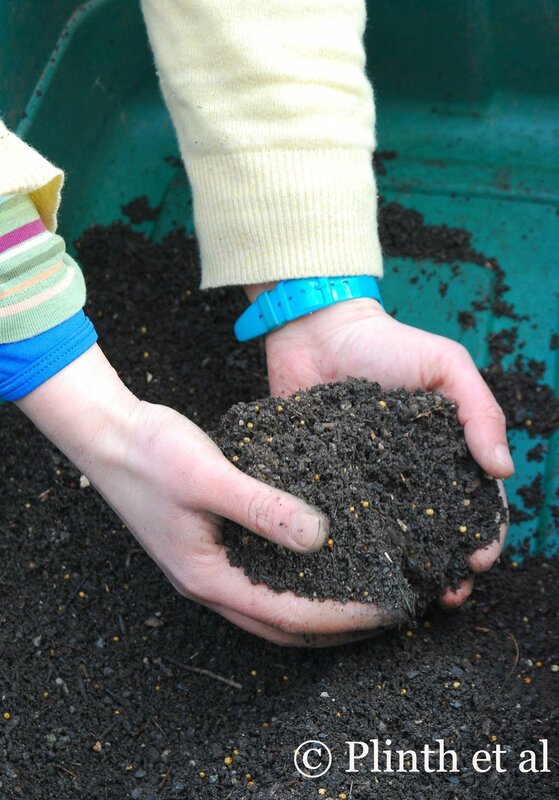 What was your first gardening experience? I remember picking the bulbils out the leaf axils of tiger lilies and snatching sugar peas from my Mom's garden. Aquilegia chrysantha 'Denver Gold' and the rich regal purples of Campanula medium (Canterbury bells) glitter like jewelry in the Cut Flower Garden at Chanticleer. Under Fergus's direction, Emma begins to organize and design the front container display at Great Dixter. Fergus Garrett, Executive Director and Head Gardener of Great Dixter, undoubtedly my greatest gardening influence and just about the coolest guy you could ever meet. What is your typical day at Chanticleer? I am a list maker and am always trying to organize and plan the garden in my mind but ultimately so much of gardening is about reacting, reading the garden and the weather and jumping in with both hands when the time is right. Bamboo canes help delineate the sections where bulbs and biennials are to be planted, a trick Emma learned from Great Dixter. Given that you had spent 2 years working at Great Dixter, how do you reconcile their philosophy with that of a different climate and garden at Chanticleer? In what ways do you anticipate the evolution of your style? Great Dixter showed me what is possible in a garden. It has been gardened with love for over a hundred years and, in that attention and dynamic style, I can see what is possible with my continued dedication to the craft. Good gardens are made up of plants which do well in each individual situation. They must sit right in the space as well as flourish culturally, so instead of trying to grow everything grown at Great Dixter, I am trying to find the right plants for each of my garden sections at Chanticleer. We often look towards United Kingdom as the primary source of inspiration and professional enrichment, and few of us venture to continental Europe (France, Italy, Belgium) to see what gardeners are achieving there as well. What are some of the gardens or techniques you found refreshing or inspiring in continental Europe? While living in England I became enchanted with France and spent a good many weekends tooling around Normandy visiting gardens, staying in Paris and traveling to the Loire. My most treasured garden experiences in France were visiting and getting to know Le Jardin Plume, a gracious and already iconic garden in Normandy. Also, I fell for the private garden of Creche Pape in Brittany, where I saw shrubs and and stone work creating ribbons and waves of volume, and a garden festival in the Loire, called Chaumont-Sur-Loire, composed of annually themed garden installations. Emma is always evaluating plant combinations for their effectiveness - to a casual eye, the dark purple Tulipa 'Negrita' and bright orange Erysimum x marshallii (Siberian wallflower) are attractive together, but needs a third partner to elevate the duet to something more sublime and interesting. While it is too late to add another plant, Emma will record her observations, a good practice for any gardener looking to better their gardens. You mentioned that your approach towards selecting and combining plants is very similar to that of a fashion designer. Can you kindly elaborate? Because I work so much with annuals, I am able to alter my display considerably throughout a single growing season. I generally try to work with a theme each year and this helps me give parameters to plant choices and color combinations. The foxtail lilies (Eremurus 'Spring Valley Hybrids') and soft orange 'Swansea' lilies rise above Nicotiana 'Lime Green', white Ammi majus, Anthemum graveolens, and Consolida ajacis in this delightful relaxed planting (Summer 2013). 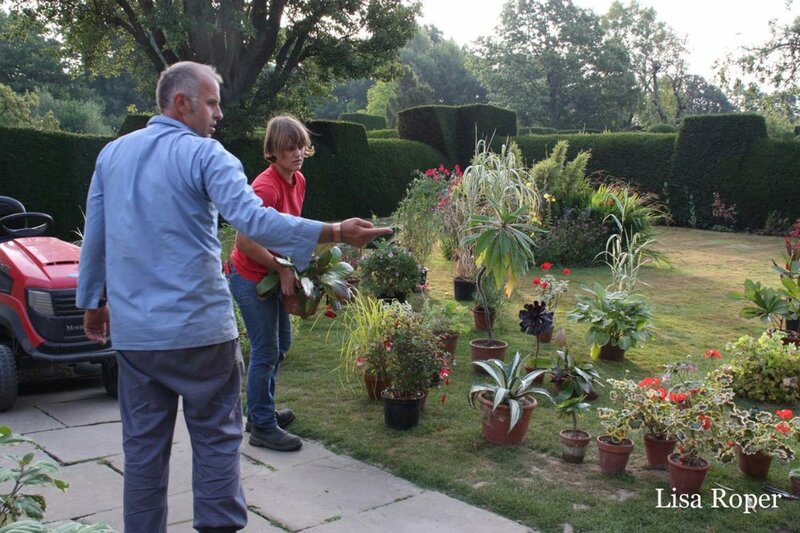 You're very involved in propagation - most gardens now have staff devoted specifically to propagation and nursery areas, or the staff tend to order plants in. What is it about propagation you find very appealing (despite the demands your garden makes on you)? To grow and propagate a plant is to know it fully. Also, with my reliance in annual displays I have control over the quality of the plant. So many of the plants bought these days are grown in a peat based medium and when planted in the garden the root system sits in the peat, unable to acclimate with the surrounding garden soil. At Chanticleer I have been using a mixture of screened compost and grit to grow my annuals and when I plant them in the garden they don't miss a beat. Emma mixes her own potting medium, which ensures plants tough enough to withstand garden conditions. 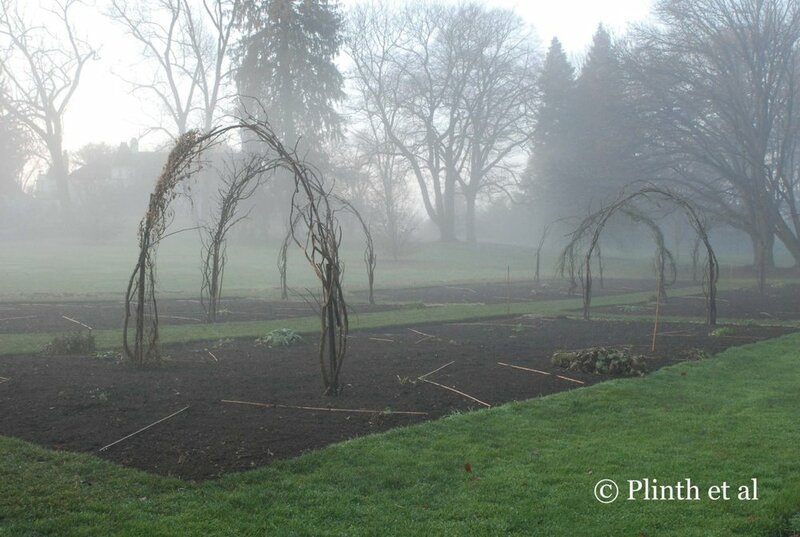 In the cold frames, Ammi majus and A. visnaga await their final homes in the Cut Flower Garden at Chanticleer (Spring 2013). If asked to describe your garden in one or two songs, what would you pick? Why? Tough one. I prefer to relate plant choices to emotions and, at heart, I'm a terrible romantic. What guidance or advice can you give to young people interested in horticulture as a profession? Look to your elders and support your peers. You're highly critical of what makes a good garden plant, as you confess how you don't have time to mollycoddle them. Can you name some of your favorite plants and their outstanding features you admire? 'Herbstonne' for its tall stature, persistent seed heads, and over two month bloom time in the heat of the summer. for their white umbels, ferny foliage, and dreamy appeal. These plants are good for a beginner grower and a rewarding late spring surprise. , an annual which self sows when in good spirits and has a way of dancing through the garden, punctuating displays with its purple flowers which last well into the season. Wiry but sturdy, graceful but impactful, it has a steadfast charm, which will constantly capture the imagination of gardeners. Emma values composites for their summer and autumn flowers, which Left to right: Rudbeckia ‘Herbstonne’ and Helianthus x multiflorus ‘Capenoch Star’; Tithonia rotundifolia and Helianthus angustifolius ‘Gold Lace’; Coreopsis tripteris ‘Lightning Flash’; Helianthus maximilianii ‘Santa Fe’ and the red Amaranthus hypochrondriacus and Tithonia rotundifolia. with a hammock strung between them. Still gardening, learning and loving it!